By this point, it should be well known among folks that I LOVE Christmas cards. Well, really just any holiday cards. Because even the new year's card we got at almost the end of January a couple years ago put a smile on my face! I love sending and receiving cards. I love displaying cards and notes from friends and family near and far. I love hearing how people are doing and watching their families grow and expand. This is the reason I started my Christmas card challenge. Well that and to add a little more fun into the season. 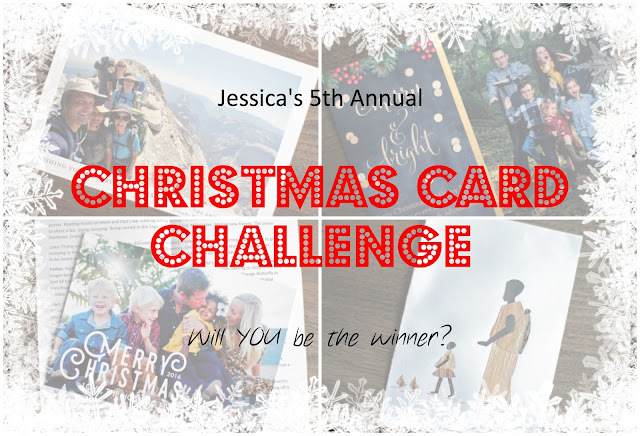 The first card to arrive category is still open for the taking folks. The last two years, it actually went to the same person. But as of now, it's an open spot for the taking! Still in the spirit of supporting my hubby (and supporting a local small business! ), I will be giving out a bag of Bean Counter Coffee Roasters coffee to the winner. How it works is, after Christmas, I will choose a winner from each category, then use a random number generator to pick the winner. If you want to join in the fun, but don't have my address, feel free to email me at jgrimbleby(at)gmail.com and I will tell you where to send it. And if you are looking for some inspiration, here are the winners in years past - 2016, 2015, 2014 and 2013. I will say, I still love the trend of doing little updates of each kid on the back of the card. Witty updates are also my jam. As are funny pictures and outtakes. So now you have an inside scoop. Now get out there and work on your cards! Black friday weekend into cyber Monday is always a great time to score amazing deals on cards and is usually when I order them every year because you can find them so cheap. I can't wait to start hanging your cards in my house!